Episode #311: Superman 2014: Year In Review! With the end of the year, it's time once again to take a break from the silver age adventures of Superman for the annual year in review episode of current Superman comic books. In this episode I review the issues 27 - 36 of the Superman titles ACTION COMICS and SUPERMAN, (I have not yet received issue 37 of either title yet from DCBS. ), and ACTION COMICS ANNUAL 3. I also review issues 5 - 8 of SUPERMAN UNCHAINED (not having received the series' final issue 9 from my comic book service). The final two comic book issues reviewed are FUTURE'S END tie-ins of ACTION COMICS FUTURE'S END 1 and SUPERMAN FUTURE'S END 1. In 2015 we begin the year looking at the Superman Family comic books cover dated October 1960, Part I featuring SUPERMAN'S GIRL FRIEND LOIS LANE 20, and Part II highlighting SUPERMAN'S PAL JIMMY OLSEN 48. The third week of the year will spotlight the Superman comic book cover dated September 1963: ACTION COMICS 304. I hope everyone had a wonderful Holiday Season, and may you have a Happy and Prosperous 2015! Legendary Batman artist Norm Breyfogle suffered a stroke during the holiday season and is paralyzed on his left side, and he is a left handed artist. As a freelancer he does not have insurance, but a fund has been established to help defray the costs of his medical treatment and rehabilitation. Please contribute if you can. Episode #310 Part II: Superman Comic Book Cover Dated August 1963: Action Comics #303! Download Episode 310 Part II! 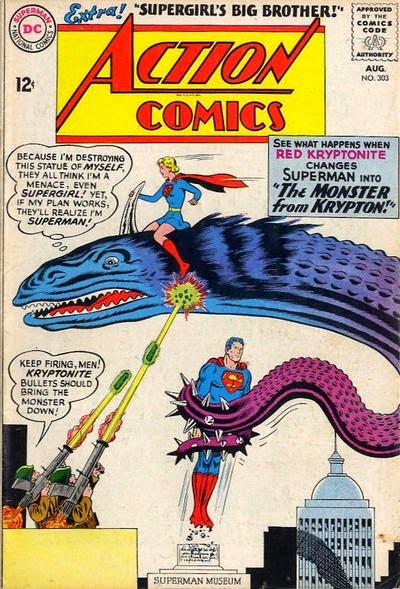 - The 12 page Superman story was titled, THE MONSTER FROM KRYPTON, written by Edmond Hamilton. This story was reprinted in SHOWCASE PRESENTS: SUPERMAN vol. IV. - Supergirl starred in the 12 page story titled, SUPERGIRL'S BIG BROTHER, written by Leo Dorfman and drawn by Jim Mooney. This story was reprinted in SHOWCASE PRESENTS: SUPERGIRL vol. II. Also highlighted in this episode are this issue's ads and other features, including the METROPOLIS MAILBAG letter column. Elsewhere in DC Comics, 31 titles carried the August or August/September 1963 cover date, according to Mike's Amazing World Of DC Comics. Next Episodes: SUPERMAN FAMILY COMIC BOOKS COVER DATED OCTOBER 1960: PART I: SUPERMAN'S GIRL FRIEND LOIS LANE 20 & PART II: SUPERMAN'S PAL JIMMY OLSEN 48! Next Week: SUPERMAN COMIC BOOK COVER DATED SEPTEMBER 1960: ACTION COMICS 304! Episode #310 Part I: Superman Comic Book Cover Dated August 1963: Superman #163! Download Episode 310 Part I! SUPERMAN 163, August 1963, was published on June 20, 1963. It contained 32 pages for the cover price of 12¢. 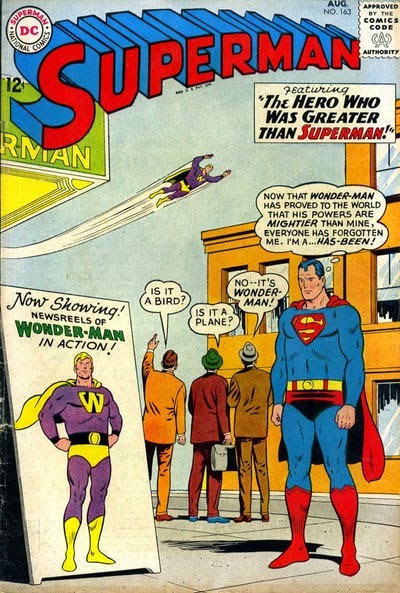 Mort Weisinger was the editor, and the cover was pencilled by Curt Swan and inked by George Klein, the art team for the first story in this issue. It featured the issue's first of two stories. Both stories have been reprinted in SHOWCASE N: SUPERMAN vol. IV. - WONDER-MAN, THE NEW HERO OF METROPOLIS (12 pgs. ), was written by Edmond Hamilton. - THE GOOFY SUPERMAN (13 pgs. ), was written by Robert Bernstein and drawn by Al Plastino. Next Episode: SUPERMAN COMIC BOOK COVER DATED AUGUST 1963 PART II: ACTION COMICS 303! Later this week: SUPERMAN FAMILY COMIC BOOKS COVER DATED OCTOBER 1960: PART I: SUPERMAN'S GIRL FRIEND LOIS LANE 20 & PART II: SUPERMAN'S PAL JIMMY OLSEN 48! Next Week: SUPERMAN COMIC BOOK COVER DATED SEPTEMBER 1963: ACTION COMICS 304!